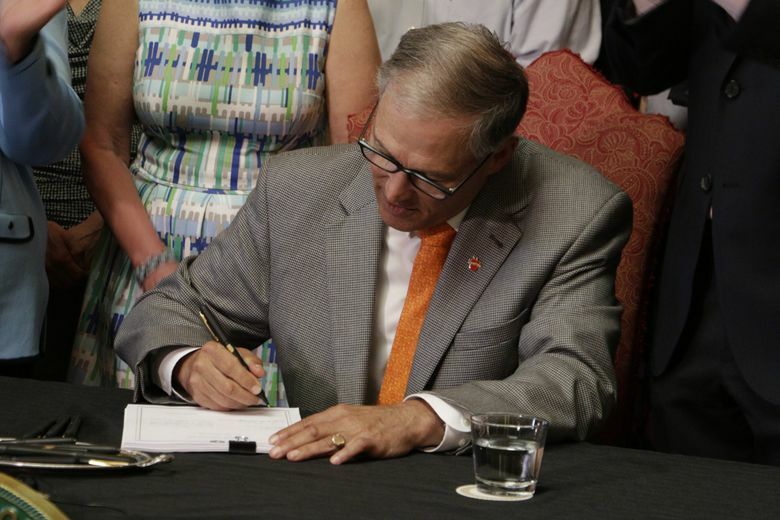 This week, Washington became the fifth state to mandate that employers pay workers' salaries when they need to take time off for the birth of a child. Our law allows a longer leave at higher rates of pay than many others. This week, Washington joined four other states in promising to cover workers’ income during childbirth, and coming up with a way to pay for it. While similar in intent, the five existing state laws mandating paid family medical leave have important differences. Washington’s is among the most generous of the bunch, covering at least three months of leave and, for low-wage workers, higher rates of pay. The law takes effect in 2020 for new moms and dads (by birth or adoption) with guaranteed pay for 12 weeks, plus another two for complicated pregnancies. That is more than three times the allowance made in Rhode Island. 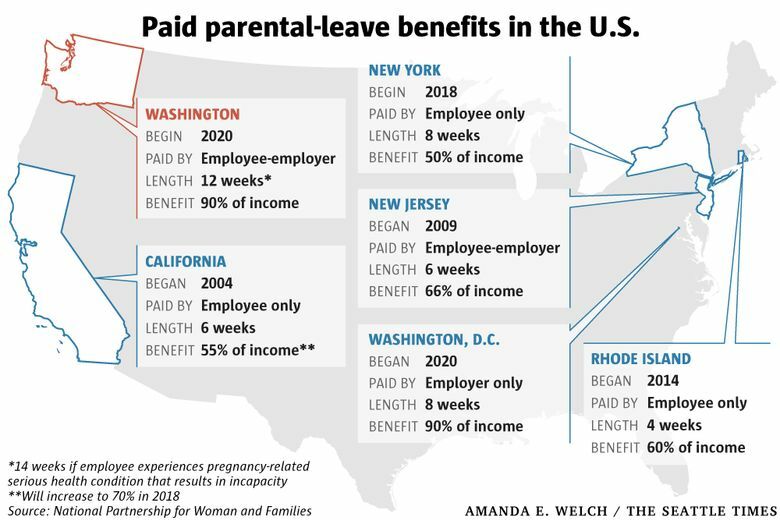 Paid parental-leave benefits in the U.S. In addition, low-wage workers may collect at least 90 percent of their weekly income. Leave also is available during a serious medical condition involving the worker or a family member. 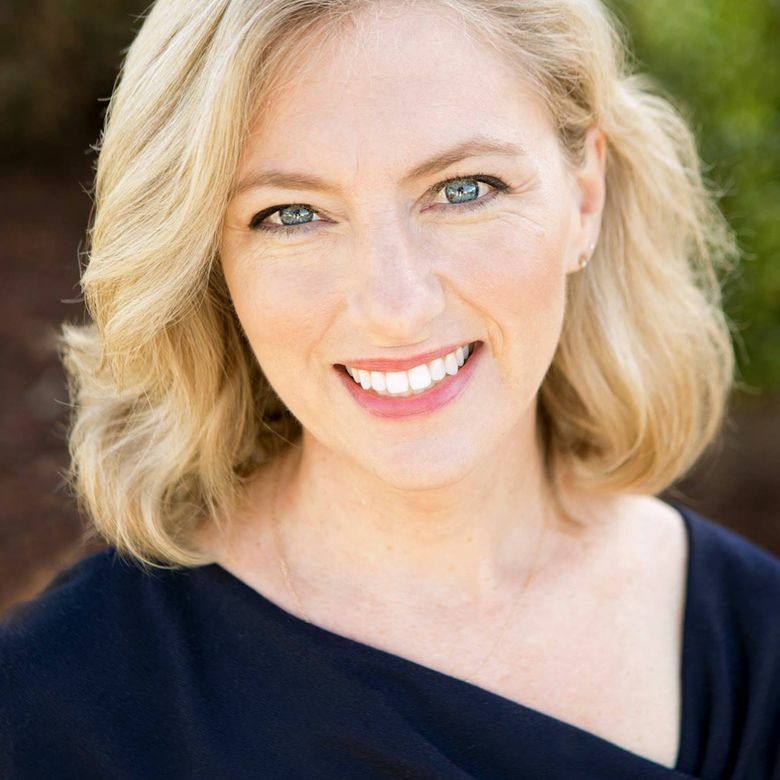 “This is a revolutionary bill,” said Kristin Rowe-Finkbeiner, executive director of the advocacy group MomsRising, whose 40,000 Washington members spent a decade working for its passage. Late last month, the bill passed the state Senate 37-12 and the House 65-29. 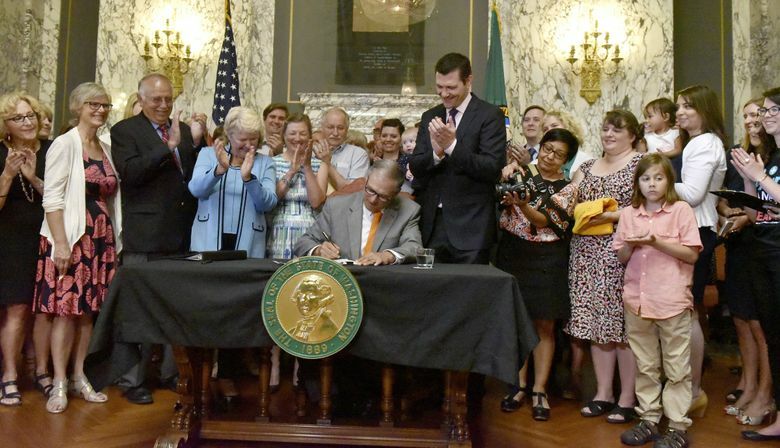 While other states have appended family-leave laws to existing statutes covering temporary disability, Washington’s is the first to be built from scratch. “It’s a real tip-of-the-arrow bill, a model that is going to break down the walls for other states. In that sense, this is a victory for families across America,” Rowe-Finkbeiner said. Paid leave for childbirth is standard in most Western nations, but has traditionally run up against opposition from business groups in the United States. Rowe-Finkbeiner credited corporate interests in Washington with huge “heavy lifting” to get the legislation passed. It will be funded through weekly paycheck contributions made by both employers and employees, similar to health insurance. In California and Rhode Island, workers foot the bill themselves. Higher-wage earners making around $85,000 annually will pay $4.12 per week, and their employers will kick in $2.42. Self-employed workers are also eligible, as is true in California, New York and Washington, D.C.
California was first to enact a family-leave law, in 2002. New Jersey followed six years later, then Rhode Island in 2013 and New York last year. Washington’s law has been on the books since 2007, but no one ever specified how it would be funded. So it remained legislation in name only.